Yamaha India is on a product offensive. After launching the updated R15 earlier this year (the company is still tight lipped on the changes in the motorcycle), the Alpha and FZ, it has updated one more motorcycle. 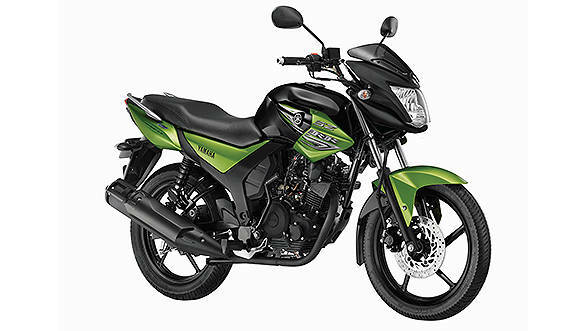 The Yamaha SZ-RR version has been launched in India with Blue Core technology at Rs 65,300 ex-Delhi. The new Yamaha SZ-RR gets the FZ Fi's 149cc engine (but with a carburettor) which makes the same power and torque figures as the outgoing 153cc motor- 12.1PS and 12.8Nm. While the power figures are made at the same 7,500rpm, the torque in the new SZ is made higher up at 6,000rpm as compared to 4,000 in the older one. The new engine is mated to a five-speed gearbox. Yamaha claims that the Blue Core tech not only adds smoothness to the package, but also aids in fuel efficiency, up by 11 per cent in the new SZ-RR. The SZ-RR gets a disc brake in the front and drum at the rear. There are also tubeless tyres and a new instrument console. A shroud and handlebar holder sporting the SZ logo are also part of the updates made to the SZ-RR. The new SZ-RR will be available in three colours- Red Dash, Ivory White and Green Arrow (pictured above). Roy Kurian, vice president, Yamaha Motor India Sales Pvt. Ltd, said, "It is our pleasure to be launching the all new SZ-RR version 2.0 this festive season at the closing ceremony of our successful endeavour of Mission 10,000km. With our breakthrough technology, Blue Core, now inducted to our successful SZ-RR model, we want to present our customers with advanced choices and fun riding in the city. Looking at the demand for standard segment commuter motorcycles which is projected at 1.1 million units in 2014, it was indeed ideal for us to delight customers in this segment with the launch of SZ-RR Version 2.0."